I decided it was time to add some color and life to my very dull and lifeless front yard. I added flowers to my pots and positioned my gnomes to greet and welcome visitors. Beyond that, I finally added the bird bath to the decor. It needs a fresh coat of paint and one day I will tackle that job, but for now, I’m just glad it exists. My mom bought me a daisy which is the motivation it took for me to go get the rest of my yard together. I planted it surrounded by petunias. I can’t wait for everything to grow more during the rest of the year. I had plenty of help with my babies running around and my fiance’ putting up the wall for the raised flower bed. I could not be more pleased with how everything turned out. I am going to buy some ground cover for the base of the flower bed, but until then, it’s housing a second flower pot. I decided to purchase flowers that bloomed all year long and that do great in direct sun. Can you see that there isn’t much shade in my front yard? I needed flowers that were going to stand the test of time. And I’m not sure if you can see, I moved the fairy door my mom painted bright colors to the flower bed so that she had a fresh supply of water and shares the company of my many gnomes. I am very anxious to actually have my own home one day because I have been put on restriction, not being allowed to buy any more gnomes because they keep getting broken. 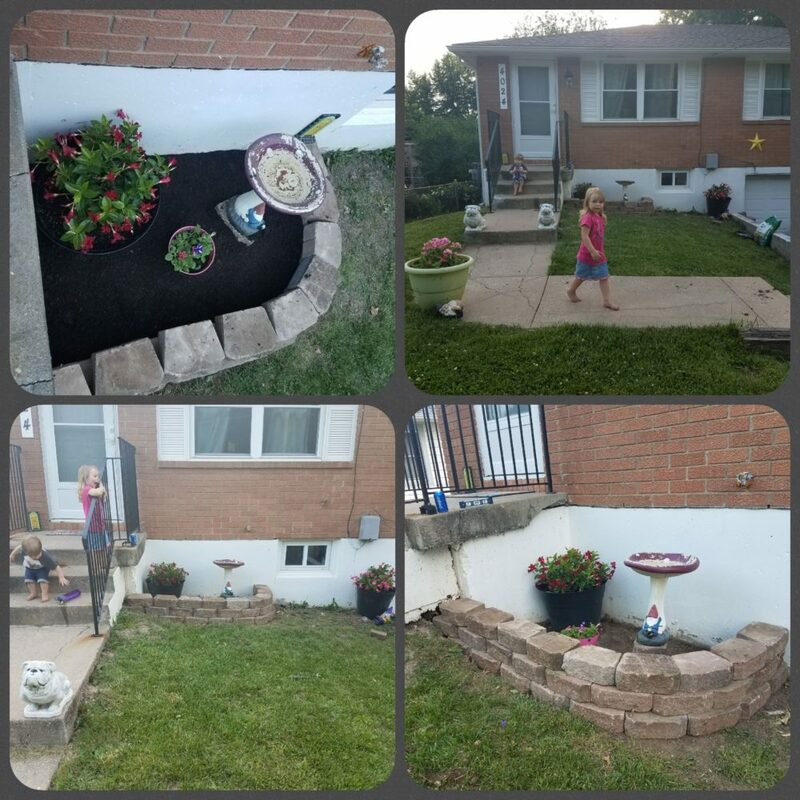 Before, I didn’t really have any place to put them, Now I have a flower bed that I am putting them in along with all the painted rocks I do to brighten things up. I have one more project and that is to paint a very bright colored mandala on the top of the bird bath, I’m thinking that I will do it in blues with some embellishments of yellow and orange! In this picture, I am showing you the flower I put in the back yard. I am very nervous about putting flowers in the backyard because with toddlers, you never know if they will leave them alone. 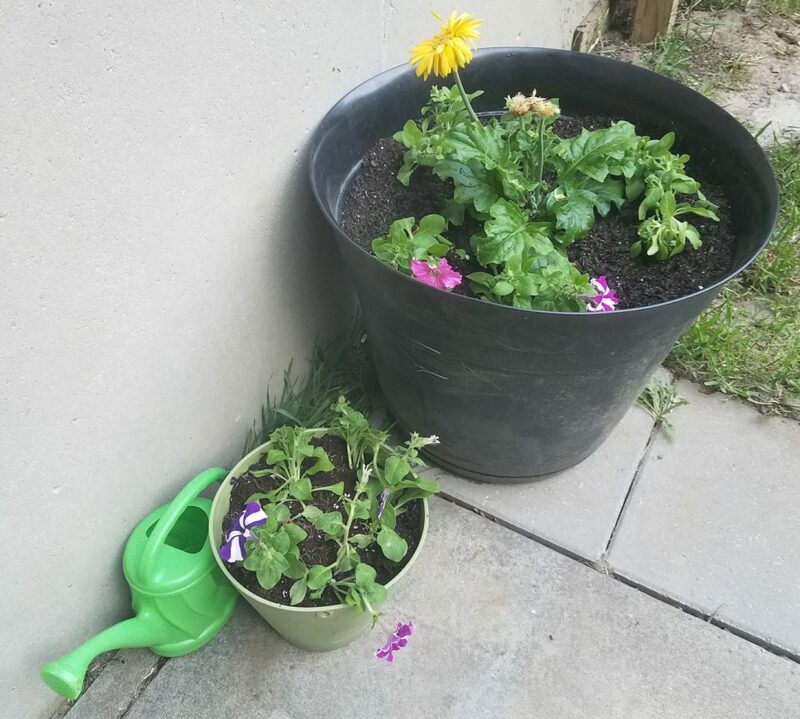 Not to mention I have a dog that peed on the pot I had out at the end of the patio last year and it slowly killed the flowers. So, I have moved these two pots closer to the house and hopefully will have the flourish over the year. Have you done any gardening? Let me know what your favorite part of the remodel is.